Let’s get crystal clear about this issue of belief – if you don’t believe that career change is possible or that it’s possible for you, it will never happen. Which one is holding you back from imagining, designing and building a more fulfilling working life? When I tackled these doubts head on and acted on some of the 7 ideas below, everything changed. and that I could chart the career change course. To find out what my 7 tips are to strengthen your self-belief, watch this 16-minute video or scroll down to read the rest of this article! Here’s this hard-won wisdom to launch your career-change year. getting a new hair style, taking up a new hobby, learning an instrument…. What changes have you already created in your life? Write them down. This is your evidence that you have the necessary skills to change things. You have the vision, the desire, the motivation, the action, resilience, the see-it-through-ability. There was a before and there was an after. Therefore, you can do it again. I already hear all those objections your inner critic is raising… ‘but this is different’, ‘there’s more at stake now’..
yes, this may be true, but the fact remains, you CAN make change happen. why it matters to you – more on that later. What are your strengths? What are you known for in your current organization or amongst your friends? What achievements are you most proud of in your life and your career? or other personal qualities (like collaboration). List them down. to transfer these success stories into a new arena. But first you have to believe. that drives your career change to success. is essential to your well-being – and probably to those around you too. … or what if you fly? But are you going to let them rule what Mary Oliver calls this ‘one wild and precious life’? We all have fears about earning enough money, being good enough – about being enough. Who is the best judge of that? Don’t hand your power over to imaginary fears about what MIGHT happen. Start noticing your saboteurs and distance yourself from those voices. Chances are these are voices from the past: perhaps a harsh teacher, a judgmental parent, a vindictive relative or jealous friend. but it is so worthwhile to be able to know what’s happening here and to choose to follow your more powerful self! At times, you may not believe it, but I do. Think back to a time when you were at the top of your game, when work flowed, you were using skills easily and fluently. People around could see your strengths and admire you for them. aspects of this work – to see people re-connect with that accomplished, able person. new waters, pushing at the edges of your comfort zone, imagining pastures new. all these help to make ‘change’ more normal. Get used to it! Practise it every day. This is the nourishment you’ll need to sustain you on your path. Find the things you simply love doing and do more of them. Perhaps one of these things could form the basis of a new career option. But even if not, they will make you happier. And when you’re happier, you’ll have more energy and motivation to carry your plans forward. So, indulge yourself - go and dance in your sunny spots! magic you up a new career that fits you perfectly. change process with its own strategies and tactics to make a new career a reality. And when the time is right, you’ll be ready. and will have the next steps clearly mapped out. 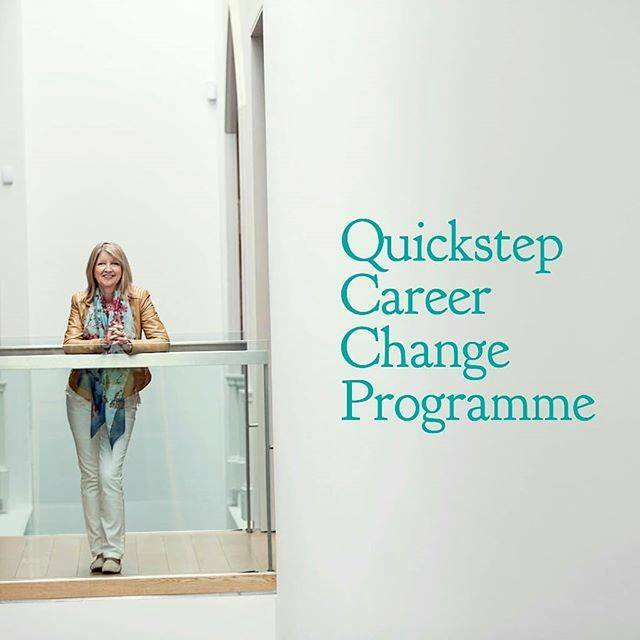 To find out more about the process I use with my clients, please take a look at The Quickstep Career Change Programme. the working life you really want. I’d love to be part of helping you build belief that change really is possible!